I have no idea how the hell I missed this place! I think I’m going to have to go back to Sirocco just to dine alfresco on the sixty-third floor of Bangkok’s second tallest building! The venue wasn’t meant to be just another roof bar or restaurant but a venue for elegant atmosphere or something along these lines. It first opened in the winter of 2003, completely reviving the dying Bangkok dining scene in many ways. This was the first of the Dome’s venues, and obviously generated a lot of buzz! I’m presuming that the biggest reason for this was simply because people were very curious to see the view from the one of the tallest buildings in Bangkok, 2nd but it does have the highest outdoor balcony. The Sirocco roof bar restaurant is pretty breathtaking jutting into the skyline of the city like the deck of a space ship with the entrancing glow of the Sky Bar. To add to this the Sirocco bar is also one of Bangkok’s best live jazz venues. Sirocco feature international performers six nights a week! Im at the Airport waiting for a flight so Im going to check it out now! Alex what kind of price range are we talking per head at the sirrocco. i am visiting bangkok for one night and would love to visit. Do you have to make reservations months in advance??? Had dinner there on 25th of Oct. We ate in the Italian restauranat inside. Well worth the money. Bottle of wine starts around $100.00. Dinner for 2 with bottle of wine, appitizer, and dessert $225.00. Can you make a reservation on line to eat at Sirocco? Did some research and found out that the Sirocco (meditterranean cuisine) is the world’s largest all open air restaurant. It is located in the State Tower in Bangkok, Thailand. The restaurant opened its doors in the winter of 2003. The restaurant is located on the 63rd floor of State Tower, it features amazing views of Chao Praya River and the Bangkok city. From their websites it would seem the ‘Tower’ also houses a hotel and other bars and restaurants on various floors, with the Sirocco being the main draw. 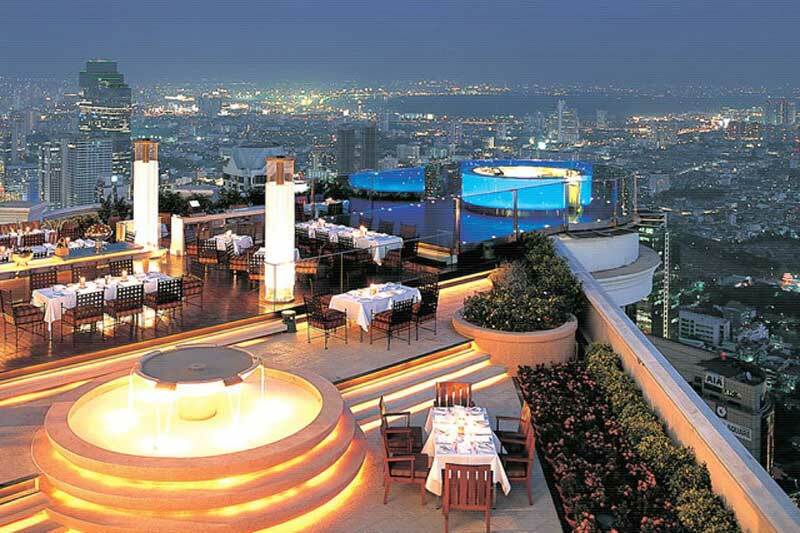 The Thai have a penchant for roof top venues and the latter website lists a few more great ‘places in the sky’ to visit. This place sounds awesome.Would like to know what would be the cost for cocktails and dinner for two? Amazing view, yes that looks like a place not to be missed. I believe that is the # 1 or #2 roof top restaurants that was ranked on another travel website, forgot the name. Looks like it’s worth a meal up there just to take in the view. You really have good views from up there. Food is a little expensive though. There are some other great restaurants in Bangkok although none of them has the views. What do you prefer? The food or the views? This was really an awsome experience.Very upmarket and so hi up in the sky……I wish I could find my photos of whern I was there in 2005….. I imagine is has to be so high to escape the traffic fumes. Bangkok is one of the most traffic congested cities on the planet. This is somewhere I had to miss on my last visit due to being on a budget. Definitely on my list for next time though!